Assist drivers in finding spaces, exits and direct them to place correct destination. 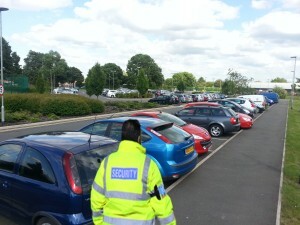 Our security officers will ensure any incidents are dealt with, recorded and reported. If necessary, Police and ambulance services will be called, and where appropriate and obtain information about drivers and other persons involved. Officers will help to ensure that gates, signs, lighting and other equipment are checked and properly maintained. We will also make suggestions where we identify scope for improvement.